Dan’s wish: 12 points of Christmas! Dan Burn believes now is the perfect time for Wigan Athletic to ‘kick on’ – and hammer home their advantage over the rest of League One. Latics kick-off their festive programme this weekend at Wimbledon, having extended their lead at the top of the pile to four points with the 2-0 victory over Fleetwood. And with four games coming up between now and New Year’s Day, Burn wants the side to open their legs and show their class. “It’s going all right at the moment, with a tough Christmas coming up,” Burn told the Wigan Post. “To be four points ahead of the rest puts us in a great position, ready to kick on. “We’ve got four big games coming up before the New Year and we know 12 points would put us in a fabulous position. “You always have to stay focused on what’s in front of you, because a couple of losses and all of a sudden teams are right on top of you. “At the minute we’re trying to pull away as much as we can. “People are just waiting for us to slip up – we know Blackburn are on a great run – and as the gaffer’s said, we will lose more games. “The important thing is not to get too down when we do lose, because we know we can’t play at our best every week. 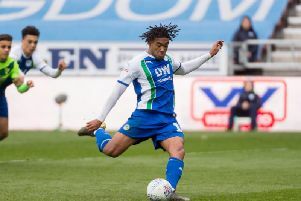 Latics will be strong favourites to extend their win streak this weekend against struggling Wimbledon, but Burn says the side will be taking nothing for granted. “It’s a big one for us, going down to Wimbledon,” the centre-back acknowledged. “We know people will be expecting us to go down there and win the game, but that’s not how it works. “Everyone expected us to beat Fylde at the first attempt, but it proved anyone can beat, or match, anyone on the day. “We can’t complacent – because that’s probably going to be our biggest problem. “Obviously we know there are some very, very good teams in this league. “But we do feel that we should be up there with the best. On a personal note, things couldn’t be going any better for Burn, with the defence boasting the best record in the division, and the ex-Fulham man having popped up with two goals already at the other end. “It was great to get on the scoresheet again against Fleetwood,” he admitted. “I have said before it was an aspect of my game that I was looking to try to improve. “It’s been lacking in my career, I know I haven’t scored enough goals. “I didn’t really have too much to do, it was such a good ball in from Lee (Evans). “Apart from the two crosses for the two goals, I don’t think we created too much in the game. “We know we’re not playing particularly brilliantly, but we’ve scored two headed goals and we’ve kept a clean sheet. Burn’s also set himself an early New Year’s resolution – staying out of referees’ notebooks and avoiding unwanted suspensions! He missed the recent trip to Rotherham after reaching the five-booking mark, which he’s determined not to let happen again. “It was so frustrating to miss out the other week,” Burn added. “I’ve found myself getting a couple of bookings for chatting back to the referee, which I’ve always tried to work on. “I just get really frustrated sometimes with what’s happening on the field!